The skin around your peepers is sensitive and thinner than the rest of your face. It reacts more easily and more noticeably to the environment, including weather, products, allergens and also to what you eat, drink or how much sleep you've had. Here are my tried and proven ways to reduce the puffiness that results from using products that are too strong, lack of sleep, weather and allergens. Vacuum and reduce exposure to plants/foods/dust: The delicate skin in your nose and around your eyes reacts most strongly to allergens in the home, office and outdoors. I have an allergic reaction to dust - my nose gets dry and red and my eyes water. You can easily get tested for your own allergens. Vacuum regularly and avoid - as much as you can - being around environments where you're exposed to dust or cat/dog hairs, certain grasses and plants that cause you to sneeze or get watery eyes and nose. Use targeted products for eyes: Some products can make puffy eyes worse so pick carefully. Also, do not overdo it! Make sure you tap the product on lighty and not too close to the tear duct. If it gets INTO your eyes, you'll be much puffier than you started! 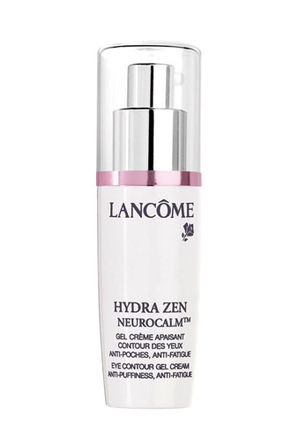 I swear by Lancome Hydra Zen Eye Cream because it is designed for sensitive skin. It works quickly and intensely to soothe and calm the skin, and also moisturises and hydrates. It's not your pharmacy el cheapo eye product, and that's probably why it really works. Recommended. Leave two small spoons in the freezer/fridge: In the morning, place these over your eyes. They will shrink the blood vessels and work to reduce redness and puffy skin around the eyes. Hold for as long as the spoons remain cold. Eye drops: I buy saline eye drops and keep them in my handbag. Sometimes you can't avoid allergens or your eyes just become dry and tired from looking at a screen. Try Murine Clear Eyes and also their Eye Mist. The mist is sprayed on your eyelids with closed eyes and works to hydrate and soothe red, tired eyes. Drink water: Staying hydrated is really important and allows your body to keep cleansing and refreshing from the inside. Being dehydrated will show in flaky, dry, sensitive skin and eyes. If water bores the hell out of you, add some lemon or lime juice! But you want 1.5 to 2 litres daily on average.